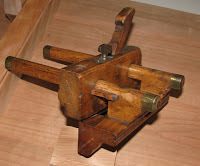 The presentation at last night's woodworkers' meeting was given by Dean Swagert, club member, who built his own Rose Engine Ornamental Lathe from plans printed in an article in American Association of Woodturners publication. Dean is a Rock Star Woodwo rker. The Rose Engine gets its name from the shape of the rosette wheels that play a part in the shape that is cut into the workpiece. 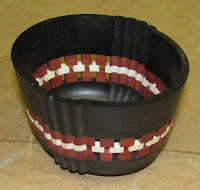 Several other variables, like position of the carbide cutter, design of the rosettes (you can stack more than one on the machine), use of the indexing plate, and shape of the rubber, can also alter the design. 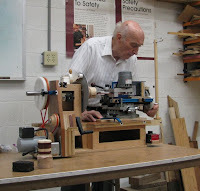 The rosettes are fastened to a headstock that pivots back and forth and bounces off the rubber; the wheels are turned with polyurethane tubing; the motor is 7.5 rpm, direct drive; and for increased precision, Dean installed a variable speed motor and compound gear system. Dean turns pieces on a regular lathe that are simply amazing. He explains how he makes them, but it's way over my head. 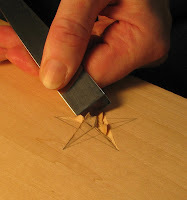 He also makes traditional Japanese tansu cabinetry, with hardware made in Japan. 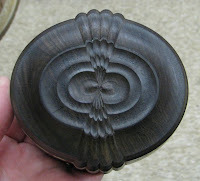 And here are some of the pieces this quiet, humble, Korean War veteran has made with his Rose Engine Lathe. Enjoy! YouTube video using an ornamental lathe. Plans to build one of your own. 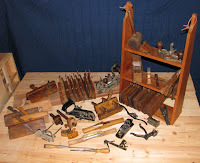 Rose Engine Lathe and parts for sale. 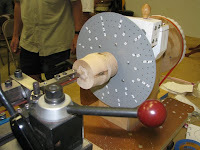 Previous post about the Rose Engine Lathe. Starting tomorrow, I will be resting easy for 5 days, a stack of woodworking books at my side, people bringing me food and drinks, friends visiting me, no dishes to wash, no laundry to clean, and no dogs to walk. It's a "vacation" at our local hospital, following surgery. Sheesh, the things a gal has to do to get a break from work! Just wanted to let you know that I won't have computer access (my worst fear come true), so I won't be able to comment or post for a little while. Yesterday, we toured the Wharton Esherick Museum, located in Paoli, PA. Esherick, known as "the dean of American craftsmen" was born in 1887 and began his artistic career as a painter. 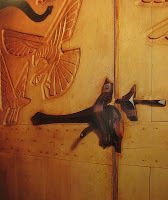 From there, he took up carving, woodcuts, sculpture, and furniture-making. 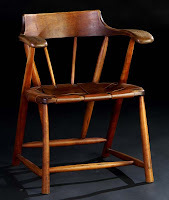 I knew nothing about Esherick prior to the tour, but learned that he was a major influence in the woodworking styles of Wendell Castle, Sam Maloof, and Art Carpenter. Unfortunately, visitors are only able to take photos outside the complex. Images of his work and shots of the studio interior t hat are included in this post were found online and on postcards. But they are nothing compared to seeing the pieces housed in his studio, and the studio itself, in person. I was awestruck. Seemingly every inch of the studio's interior had been touched by his hand. The first thing you notice is the crazy, curved, out-of square angles of the structures. 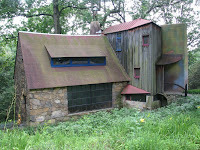 Even the roof lines of his studio and lumber storage building were purposely made to look like caving-in barn roofs. 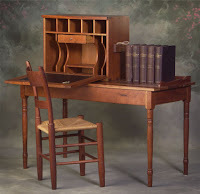 Inside are furniture pieces that defy traditional woodworking tenet s, perhaps because he approached woodworking as an artist, with no formal woodworking training. 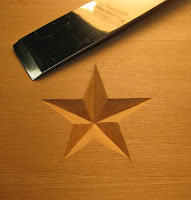 One dining table's surface was built with three boards, none parallel to one another. Two figured planks had been sawn in half from one board, but rather than bookmatched, were flip-flopped, so each half of the crotchwood flame faced one another from opposite corners. Then the entire table top was cut into a kidney-shape. There were lots of free-form, organic pieces, but also angular, art de co-inspired pieces. The wall panels were placed in ray patterns; the kitchen floor was made of irregular-shaped pieces of wood that fit together like a jigsaw puzzle; and the spiral staircase used an actual mastodon's tusk as a hand rail. It was torture to not take photos. 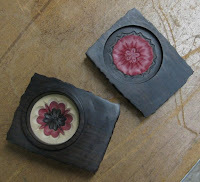 But our tour guide said a book is in the works, showcasing Esherick's pieces, and set for release in the fall of 2009. 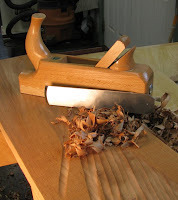 Esherick forged all of the hardware in his studio; his favorite tools were his broad axe and band saw; he used an enormous variety of hardwoods; and his finishes of choice were tung oil & boiled linseed oil. 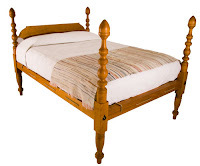 One piece, a large fold-down secretary, reminded me of Adirondack twig furniture. 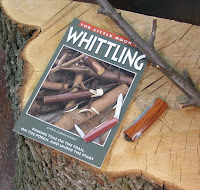 Instead of using actual twigs, however, he carved leaves and twig shapes over every surface. And this I had never seen before: the rails of the cabinet doors ended not at the stile, but continued further to form handcarved barrel hinges. The museum tour was well worth the entrance fee (only $10). And navigating the too-small parking area and the fact that they don't accept credit or debit cards were minor inconveniences. I left completely inspired. And you can't put a price on that. 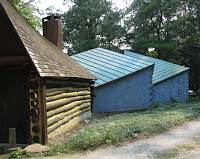 Photos include his studio (the building with the stone foundation), the gift shop (the log cabin that formerly housed his lumber), and his workshop (the blue buildings, in which his daughter now lives, and which were not part of the tour). 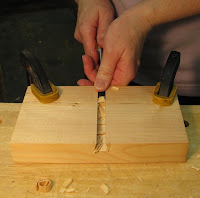 Here is one way to cut the groove for a sliding dovetail. 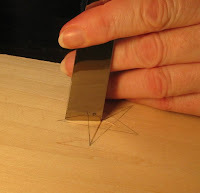 Mark the depth of cut with a marking gauge on both edges of the board. 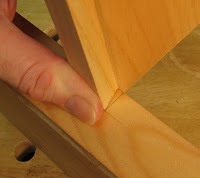 Lay the dovetail piece on top of y our work surface and trace the bottom of both sides of the dovetail. 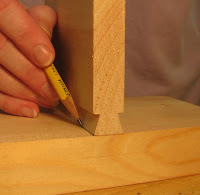 Transfer that line to your depth of cut line on both edges. 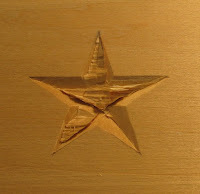 Now you can see where to position the dovetail on the edge of the board so you can trace its an gle. 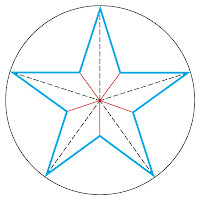 Trace this angle on both edges. 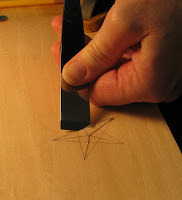 Connect these lines across the face of the board and this shows you where to start cutting. 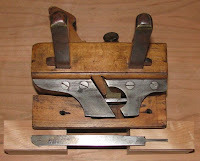 The dovetail plane I used cuts a 16º angle. Bevel a 2 x4 at this angle to use as a fence to guide your saw. I keep finger pressure on the sawblade so it stays tight against the fence. Saw down to your depth of cut mark and chisel out the waste between the saw marks. 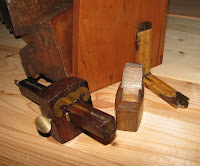 Slide the dovetail into the groove....and you're done! 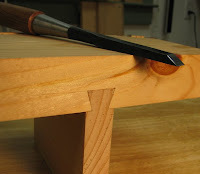 Because the sliding dovetails on the sawbuck table are so long (25"), I'm not comfortable with this technique, so I'll show another way to cut sliding dovetails in a future post.